Normally a spacer lives forever. However, when driving with the inline skates in the rain, catch ball bearing and spacer to the rust. Similarly, when driving on dirt roads and grass, thereby the ball bearing and the spacer may be damaged. 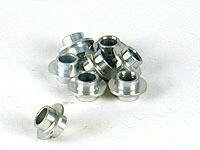 We have here 8 mm replacement spacer for inline skating.